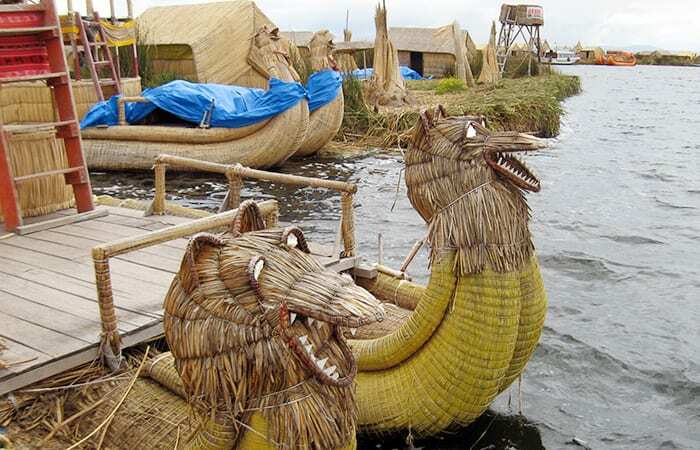 Lake Titicaca in the Andes Mountains of South America is a great site for reconstructing all sorts of history. Around the lakeshores, archaeologists have uncovered the rise and fall of the Tiwanaku civilization, which arose in the third century A.D. and expanded into Peru, Bolivia, and Chile. Later, the Incas, who believed that the sun first emerged from one of the lake’s islands, incorporated the sacred area into their vast empire. Even before these empires came onto the scene, Titicaca had a roller-coaster climate history. Strong and weak monsoons alternately soaked and dried out the lake basin. Paleoclimatologists including myself have unearthed clues in lakefloor sediments to piece together the rise and fall of the lake levels and monsoon cycles. We were able to have linked these climate changes with the waxing and waning of ice sheets and temperatures in higher latitudes of the planet. The Titicaca basin also turns out to be a good place to start to unravel the complex history and relationship between Earth’s climate and its landscape. Plants draw carbon dioxide, a greenhouse gas, from the atmosphere and convert it to the organic compounds that forms their leaves, roots, and branches. A fraction of this organic carbon ends up stored on land in soils, river floodplains, and wetlands. Together, these terrestrial reservoirs hold about three times more carbon than the atmosphere. But Earth’s changing climate could alter how terrestrial ecosystems store carbon. And even a relatively small change in this vast pool of land-based carbon could dramatically affect heat-trapping carbon dioxide levels in the atmosphere and our future climate. So today, as we worry about warming from rising atmospheric carbon dioxide levels from fossil fuel burning, understanding the complex processes that move carbon between air, land, and water can provide valuable insights to help predict our future climate. Here’s where my research comes in. I’m sifting through mud for traces left behind by scrubby grasses and gnarled trees. My goal is to track the comings and goings of carbon, as it traveled from the air to plants and through soil, wetlands, and rivers into the lake. Straddling the border between Bolivia and Peru, Lake Titicaca is 120 miles long, 50 miles wide and has average depth of 500 feet. It sits on the Altiplano (“high plain” in Spanish), a plateau poised between the eastern and western cordilleras of the central Andes. Despite its high altitude and cool temperatures, the Titicaca basin is actually a tropical site. 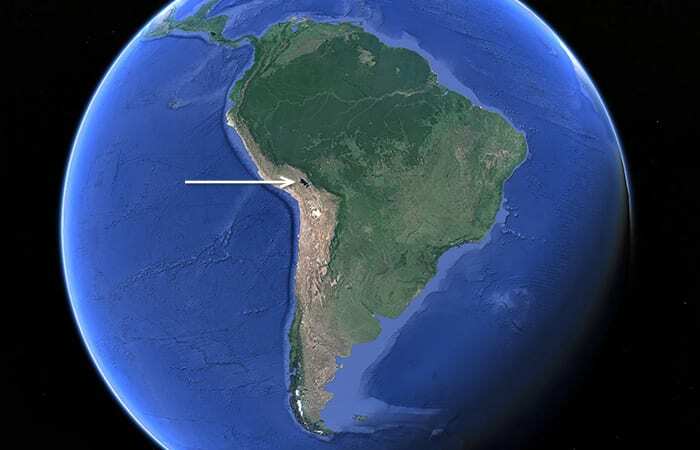 Most of its yearly rainfall occurs during the summer when the South American monsoon develops over southern tropical and subtropical lowlands. Surrounded by mountains, the basin catches the precipitation from the monsoon, and five major rivers sweep it into the lake. At the height of the last ice age 20,000 years ago, the Titicaca basin was a cooler and wetter place compared to today. 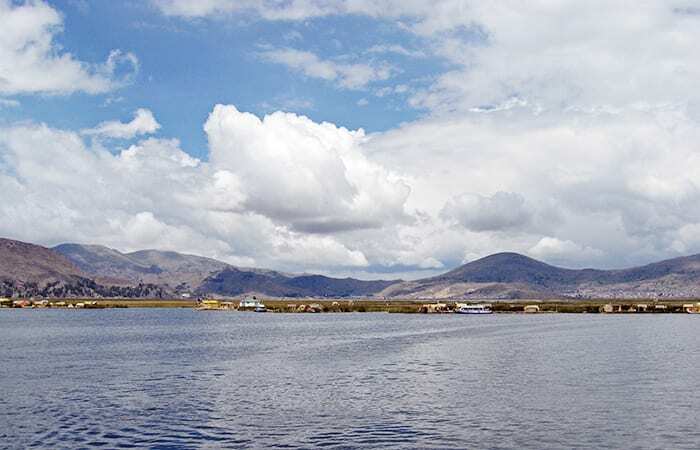 It was so wet that Lake Titicaca overflowed and water spilled out onto the southern Altiplano, forming huge, freshwater lakes where today there are salt flats. As Earth transitioned from the ice age to the current interglacial period (called the Holocene Epoch), temperatures in the high latitudes of the northern hemisphere did not warm gradually, but rather flip-flopped from warm back to cold before settling into the stable warm conditions of the last 10,000 years. 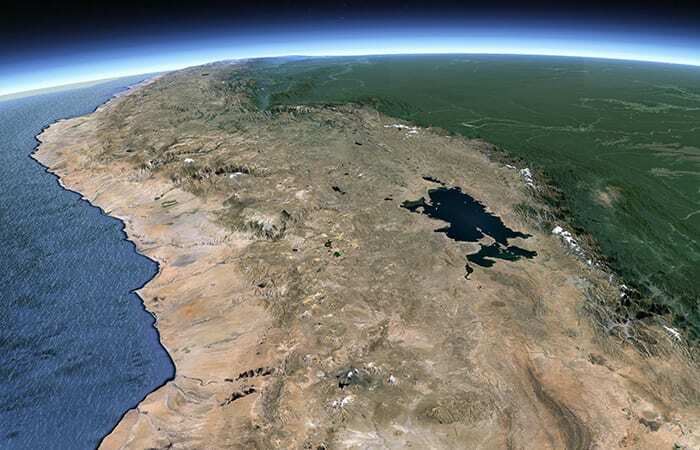 Despite Titicaca’s distance from the northern hemisphere, the rise and fall of precipitation in the lake basin coincided with these faraway temperature swings, with lower rainfall during northern hemispheric warm periods and vice versa. As warm temperatures persisted during the Holocene, so too did drier conditions in the basin. Lakes to the south of Titicaca disappeared, and in the early to mid-Holocene (about 10,000 to 5,000 years ago), Titicaca itself fell to much lower water levels. Since then, precipitation in the Titicaca basin has gradually picked up, though not to the levels of the last ice age. With a clear picture of past climate changes in the region, I can start to build a historical perspective of how climate changes might affect the storage of carbon on land. 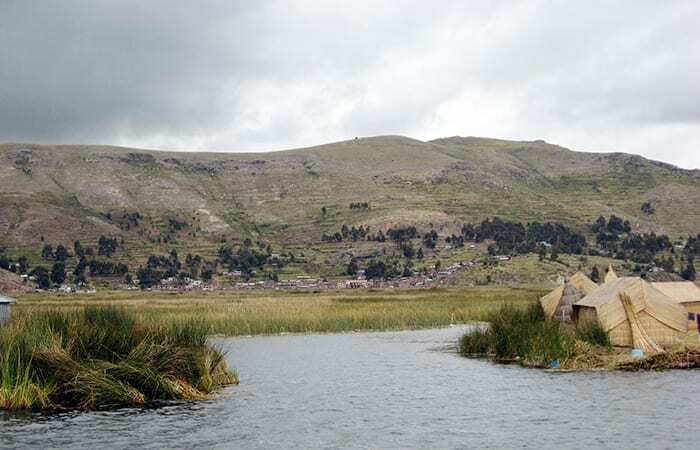 Titicaca also offers another advantage: a relatively small, simple, self-contained terrestrial ecosystem to begin to investigate the complex journey of carbon on land and between land and air. Since future landscapes are not available to study, looking to the past for examples of how terrestrial ecosystems have responded to extreme climate change offers valuable insights. It’s not a perfect fit—climate change has never happened in the exact same way as it will in the future. But if we can uncover fundamental causes and effects between climate and terrestrial carbon storage, chances are good that these patterns will hold in the future. Over time, the organic carbon manufactured by plants works its way into soils and wetlands, where microbes are on hand to chew up the carbon and exhale carbon dioxide to the atmosphere. Competing against biological degradation are other physical processes. Erosion and soil leaching, for example, propel a fraction of terrestrial organic carbon into rivers and onward to lakes or the ocean. The speeds of these biological and physical processes vary, meaning that organic carbon can sit on land in soils, wetlands, or river floodplains for anywhere from weeks to millennia. Among other factors, climate plays an important role in changing how fast or slow these processes are. Microbial decomposition, both above and below ground, is dependent on temperature and precipitation. Precipitation drives erosion and river transport. With many different components operating in a terrestrial ecosystem, however, the net result of a change in climate isn’t easy to unravel. Though it may seem counterintuitive, the best place to look for evidence of changes in the terrestrial carbon cycle is under water. Soils are rarely preserved over thousands of years, but layers of sediments have been neatly stacking up at the bottom of Lake Titicaca for hundreds of thousands of years. Contained in these sediment layers is the small fraction of terrestrial organic carbon carried by rivers and deposited on the lake floor. In 2001, a drilling expedition led by the International Continental Drilling Program extracted a number of lake sediment cores more than 100 meters (328 feet) long. These provide archives of terrestrial organic carbon through time, with different sections of the cores corresponding to different periods in the past. As might be expected, sediment archives can be a bit messy. Each slice of mud from the core contains a jumble of organic matter, derived from aquatic organisms, bacteria, terrestrial plants, even ancient carbon weathered from rocks. To separate the terrestrial carbon from everything else, I’m focusing on particular molecules known as “biomarkers.” Like fingerprints, biomarkers are molecules specific to only one organism or group of organisms. I am targeting a class of compounds known as long-chain fatty acids. Vascular plants produce them as part of the waxes that coat their leaves. Every living thing makes fatty acids, commonly with chains of 16 and 18 carbon atoms, but land plants are the only organisms known to make longer chains with up to 32 or 34 carbon atoms. While terrestrial organic carbon can take many different forms, long-chain fatty acids can be found in both fresh leaf litter and aged soil, making them a good representative of organic carbon derived from plants. Once I have extracted these leaf wax compounds from core samples, I can find out how old they are by using radiocarbon dating. This technique takes advantage of the decay of naturally occurring radioactive 14C atoms that plants incorporate into organic compounds. From there I can start to work out the routes they took to the sediment. In particular, I’m trying to reconstruct how long these molecules spent on land before they were deposited in the lake sediments. To figure out the time leaf wax compounds spent on land, I compare their ages to the age of the sediment layer in which the wax is found. The difference will be the average time the carbon was stored on land. I’m also investigating how climate changes affected this storage time. Depending on how fast carbon moved from plants through soil, wetlands, and rivers to the lake, they might have been quite old by the time they made it into the lake sediment. 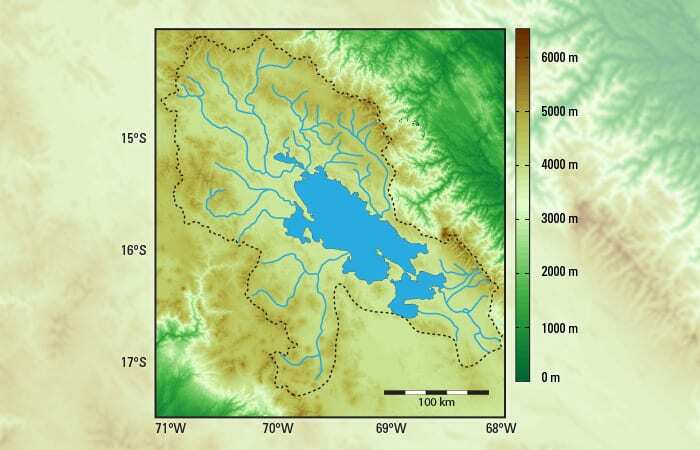 If a climate change increased or reduced the time carbon was stored in the basin, this will be reflected by older or younger terrestrial carbon input to the lake. By comparing the average storage time during periods of different climates over the past 20,000 years, I can piece together how changes in precipitation and temperature affected how terrestrial carbon cycled through the basin. With any luck, my research will start to illuminate the links between climate and terrestrial carbon storage. Though the basin has often served as a backdrop for human history, the history of the landscape itself may offer clues to future climates that will set the stage for the next chapters of human history. If you subscribe to Incan mythology, it wouldn’t be the first time light has emerged from Lake Titicaca. This research was funded by the WHOI Ocean Ventures Fund and an EPA STAR fellowship. Lake Titicaca is located in the Andes Mountains, straddling the border between Peru and Bolivia.